Today began with another teaching session. This time I was able to talk about developing a more advanced search strategy for finding health literature online. Gwyn gave another great lecture which again included lots of audience participation as he emphasised the key points he had made about eye care throughout the week. We have a register that we pass around to the students every morning for them to write down their names and home countries. It’s incredible to see how far many of the students have come from across Sub-Saharan Africa. I had lots of enquiries about Hinari after the session and I was able to have a one to one session with Mr Mendy who is in charge of the educational programmes at SZRECC. Hopefully he will be able to cascade this information on to the students who continue to study at SZRECC in the future. Zainaba and I then went to visit the National Library in Banjul. We met the Director General, Matilda Johnson. She gave us a tour of the library and told us about an on going project to deliver children’s books to schools across The Gambia in rural communities. 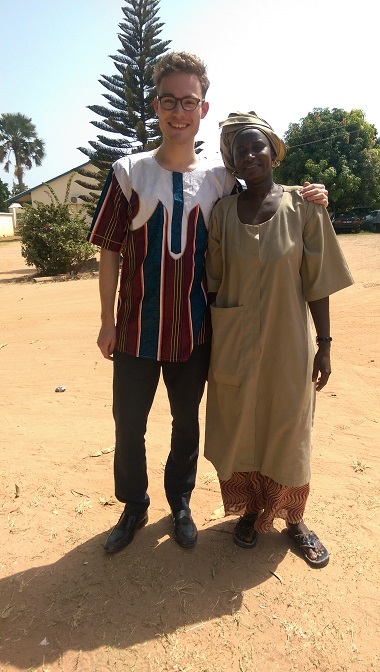 Matilda also informed me that there is a Gambian Librarians Association and I took their details to contact regarding potential training opportunities in the future. Tonight we are having a meal with the rest of the team at SZRECC to thank them for their kind hospitality throughout the week. Tomorrow is a public holiday here so there is no activity in SZRECC. It will be a chance to say goodbye to the many good friends that we have made this week. This morning I had the chance to teach information literacy skills to the staff and students at SZRECC. I spoke about free resources (such as Pubmed, TRIP, Hinari, NICE) that are available online to support evidence based practice. I then encouraged students and staff to fill out literature request forms which I could then take back to the library to teach Zainaba how to access information online. Gwyn in his following lecture kept referring back to the importance of being able to access information to answer clinical questions, which really helped to reinforce the message we wanted to put across. After the teaching session we headed into Banjul for a busy morning of meetings. We first went to meet the Honourable Minister for Health. Amadou and Stella were able to tell her all about the Swansea- Gambia Vision 2020 Link and the Minister expressed her thanks for the good work that the Link is doing. Stella asked for permission to write up a Memorandum of Understanding that she could sign next year to cement our relationship with the new government. Gwyn also told the her about our plans to establish a diabetic retinopathy screening service in The Gambia and the Minister seemed very supportive of this. 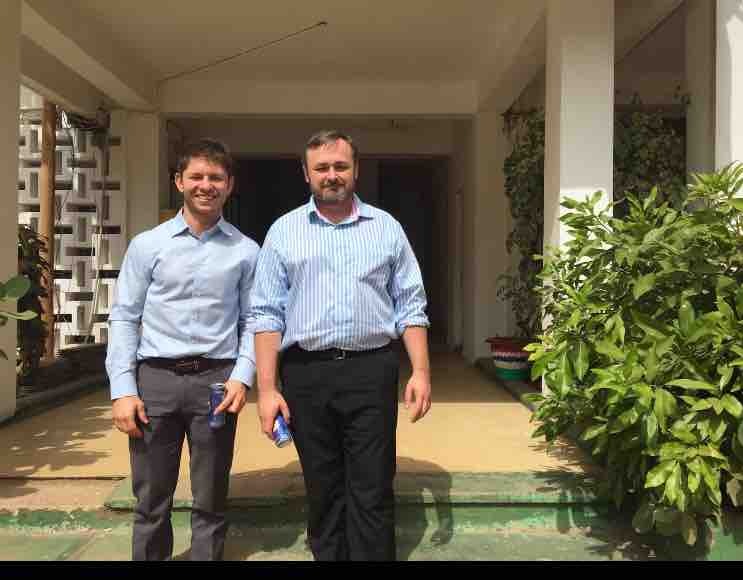 Next we visited the Standard Charter Bank in Banjul to meet with the Seeing is Believing Team. They were instrumental in financing the initial building of SZRECC. Again, Amadou and Stella gave a good overview of the Link and the work we hoped to achieve in the future. Once Gwyn had explained his idea for a diabetic retinopathy-screening programme a worried member of the Seeing is Believing Team actually asked Gwyn if she herself could come for a screening as she is a diabetic and had never been screened. 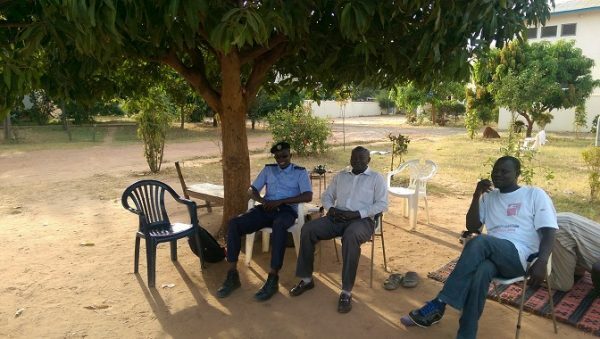 So this really served to illustrate the need for such a programme in The Gambia. We then returned back to SZRECC for the afternoon. Gwyn and Stella headed over to theatre while I returned to the library to meet Zainaba. We went through the library inbox and discovered that we had received an institutional login to Hinari. This really made our afternoon and we looked through the database together as this was the first time that either of us had used it. We then put up promotional materials throughout the library and the rest of the hospital to encourage the students and clinicians to use it. It would have been a typical Monday morning for me it was 8:15 am I was on my way to work in a hospital library and I was stuck in horrendous traffic-except I’m in The Gambia. Amadou, a Cataract Surgeon from SZRECC picked us up from our hotel and we arrived at the hospital for around 8:30. SZRECC is a teaching hospital and teaching sessions are held every morning between 8:30 and 9:30. Gwyn Williams gave an engaging lecture on diabetic retinopathy which the students very much appreciated. We then took a tour of the hospital before Gwyn and Stella went off to begin work at an incredibly busy Monday Clinic. 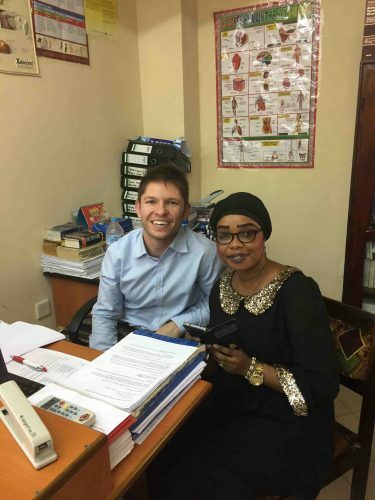 I was taken to the library to meet Zainaba the Library Assistant here at SZRECC. Zainaba who seemed very pleased to see me, gave me a tremendously warm welcome. I spent the afternoon finding out about the library service here in SZRECC and we also submitted an application form to the WHO for institutional access to Hinari. There were numerous power outages throughout the afternoon, which made it incredibly difficult to teach Zainab how to search for medical literature online but nevertheless she was patient and eager to learn. I had heard about power outages here but had not anticipated that Internet connectivity would be quite so poor. Stella, Gwyn and myself went back to the hotel and had a Julbrew and reflected on what had been a busy first day. Team 2 has arrived safely in the Gambia after a long flight into Banjul Airport. We set off in the small hours of Friday morning with extremely heavy suitcases. Stella Elliott our Vision2020 Coordinator had a vitrector, which had been brought back to the UK and repaired by our technician Paul. Gwyn Williams (Medical Retina Consultant) and myself had suitcases filled with ophthalmology textbooks. We visited SZRECC on Saturday morning to meet the team and plan for the week ahead. As it is the first time that either Gwyn or myself have visited the Gambia it was a good opportunity to meet many of the people that we had heard so much about in Swansea. It was particularly nice to witness the warm welcome that Stella received now on her 10th visit and the high regard and affection with which she is held here is great to see. On a personal note I’m extremely excited about the week ahead. As a Librarian I never imagined in my wildest dreams I would get an opportunity to travel to Africa. In the months leading up to this trip I have spent some time looking at information resources that are available to developing countries. The Hinari Database produced by the World Health Organisation contains over 15,000 electronic journals and more than 50,000 e-books is available in the Gambia for free. I am eager to establish access for SZRECC and to promote it as a resource whilst I am here. 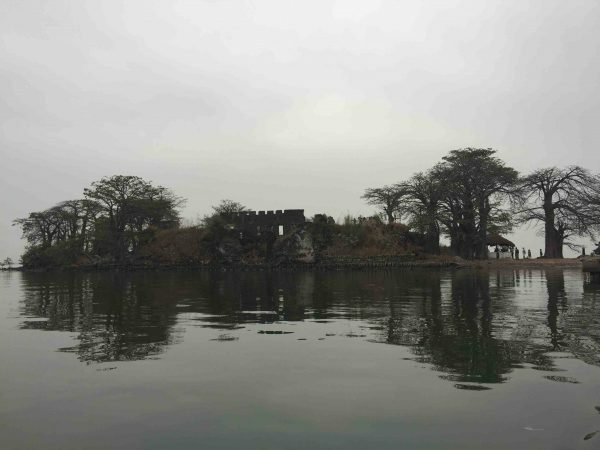 We had the Sunday off and decided to take a boat trip up The River Gambia to Kunta Kinteh Island, which had been used as a prison for slaves in the 17th and 18th centuries before transporting them across the Atlantic. Having had the weekend to settle in, we’re now looking forward to starting work Monday morning. Friday is a day of prayer in the Gambia, and the hospital closes at lunchtime for people to go to the mosque or back home to their families. This is also the reason that we generally travel to and from the Gambia on friday, so as not to miss any clinical time on other, busier days. Most of the people wear their traditional best clothes on Friday, which involves even brighter colours and vivid fabrics than normal. 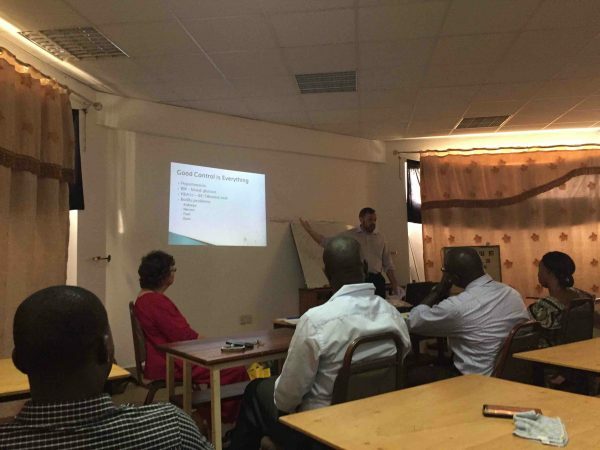 Dave led the teaching session with two talks, on biometry and paediatric refraction. Biometry measures the optical power of the eye before cataract surgery, and is a recent development in SZRECC. There is also now a lens bank, meaning that patients are usually able to have an implanted lens that matches their eye. Previously, there was one lens on offer, and anyone with an eye which deviated from the norm would need glasses after surgery just to make up the difference. After the lectures, we went to examine the four paediatric cataract cases from yesterday. 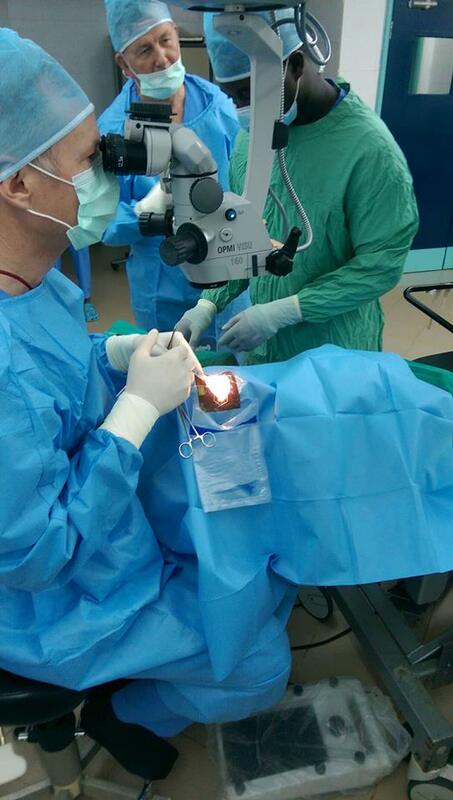 Dave was really pleased with his surgery, and although the children still had a cataract in their other eye, some of them were already saying they could see better than before. In the meantime they will be checked for glasses to correct any residual refractive error, and a bifocal for reading. There were no patients for me to see, so before the debrief at midday, I spent an hour going round the clinic saying my goodbyes to everyone that has made this visit so enjoyable. Apart from the Link’s long-term commitment to continue providing training, it’s the unsurpassed generosity and welcoming nature of the SZRECC staff that makes us most excited to return year after year. I was given a bright and flashy kaftan by Rohey, one of the cleaners that had taken me under her wing on my first visit last year. It looked awesome and I can see a chance for Singleton to update their uniforms to follow suit. We left for the airport not long after the debrief, having had one last round of photos with everyone. 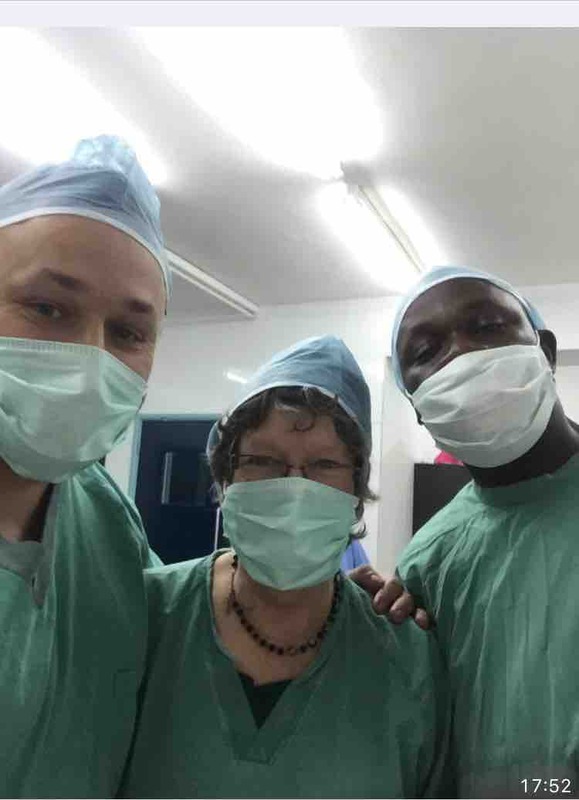 The next team will arrive in a couple of weeks, consisting of Stella Elliot, link co-ordinator, Gwyn Williams, medical retina consultant, and Rhys Whelan, informatics and information technology. Thursday is theatre day in SZRECC, and four of the children we’d seen on Monday had been listed for Dave to remove their cataracts. Despite us seeing over 20 children with cataracts, 9 of them were bilateral, making them the higher priority. Unfortunately due to the anaesthetist being ill yesterday, Dave was unable to operate, and losing precious theatre time in which some more cataracts could have been removed. The day began once again with teaching, something I really think that Singleton and other UK hospitals could learn from, by having a short session each morning. Though the schedules have been cleared for the visiting team to present talks, usually it’s an opportunity for staff to present cases, audits, and for the students to receive general teaching. John presented a talk on surgical treatment of lower lid entropion (when the lid folds inwards, which can lead to severe irritation from eyelashes scratching on the surface of the eye), and then I presented an introduction on using logMAR visual acuity tests (a far more accurate way of testing visual acuity than on the historic Snellen chart). The hospital is looking to transition over to logMAR in the near future, so hopefully the training will come in handy for that occasion. As there are few patients booked on Thursdays, and no children, I spent the remainder of the day in theatre. I watched Dave operate on the paediatric cataract cases, and some of the adult cataract surgery happening in the next theatre. I was entrusted with John’s expensive camera, and like last year, set about taking interesting pictures without getting in anyone’s way too much. I was also asked by Dave to adjust the microscope at one point which made me feel highly important. The children had the cloudy lens in their eye removed and replaced with an artificial implant made of plastic, which is calibrated in such a way that as the eye grows it becomes the correct size for the lens’s power. Glasses are still required after the operation, to fine-tune any refractive error that is left outstanding, and also to provide near-task focussing through a bifocal or varifocal. The children with bilateral cataracts will most likely have their second cataract removed at a later date, but at least for now they will have a renewed opportunity to develop the vision in one eye. Adult cataracts in the Gambia are removed by cataract surgeons, eye trained nurses who have trained in the surgical technique. They use a revolutionary technique called Manual Small Incision cataract surgery (MSICS), which is very cheap, very fast while being highly effective, and generally requiring no stitches and no post-operative assessment. 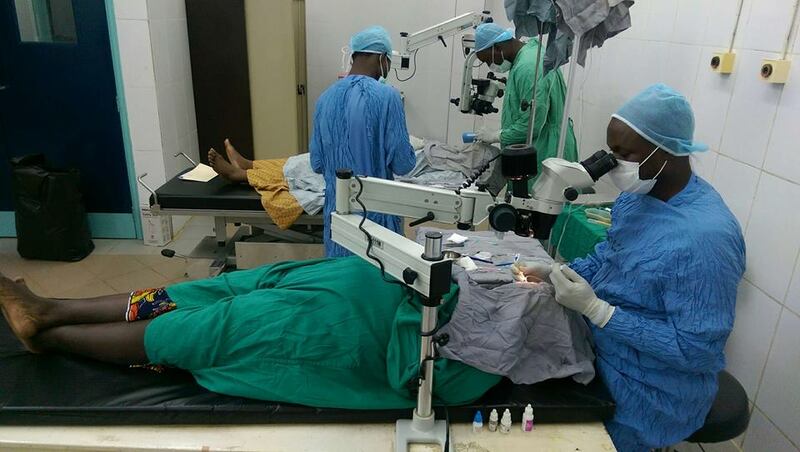 Watching Amadou perform this surgery was amazing as the procedure was completed in little more than 25 minutes, and afterwards, underneath their protective eyepatch, the patient now had an eye with mostly restored vision. As cataracts are so common in Sub-Saharan Africa and the developing world in general, this technique is now widespread. I found watching both types of procedure highly rewarding, and really put into perspective the magnitude of the problem that the Gambia faces. A cataract surgeon will on average operate on around 8 patients per session, and despite having several different surgeons available at one time, the amount of patients requiring treatment means that they’re operating flat out, all day, every day. Even so, for every patient successfully treated, there are dozens more living with visual impairment. Arriving into the lecture room this morning led to two dismaying revelations: one that we are now halfway through our short time at SZRECC, and the other that today was my turn to present a talk to the hospital staff and students. Dave gave a useful talk on examining children’s eyes, and then I followed up with a talk covering the topic of amblyopia (lazy eye). 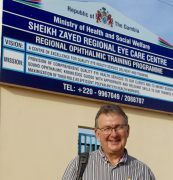 Amblyopia isn’t an immediately obvious problem affecting the Gambia, and so far I have not seen even one child resembling the amblyopic patients I see back in Swansea. The level of pathology here is a real step up in severity and complexity, and there’s little in the way of traditional orthoptic work. That being said, awareness of the condition is doubly important here, as there is a much higher risk than in the UK of patients losing the sight in their good eye at some point, and being left visually impaired as the lazy eye has no usable vision. I then proceeded to clinic, where another packed roomful of patients were already awaiting our arrival. The corridor outside the consultation rooms was also heaving with patients brandishing appointment cards, a few harangued staff members, and several despondent children already looking fed up with the wait. I used today as a chance to put yesterday’s teaching into practice, and although the clinic was busy, we had sufficient time with each child to assess visual acuity, check for and measure squints, and assess the eye movements. Again I was with Mam, the nurse who usually assesses the children, and Dou the optometry intern, both of whom had absorbed all of the tuition and used it to great effect. By 2 o clock, we’d seen 21 patients without stopping, many of them complicated cases with conditions such as congenital cataracts and corneal lacerations. The clinic ran smoothly, and I was also pleased to see many of the children apparently enjoying their trip to the hospital, not something commonly seen here. 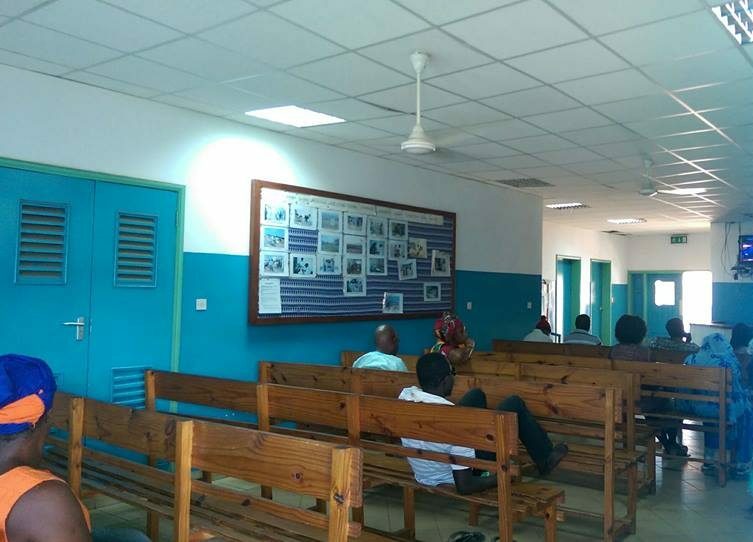 One of the bigger problems facing the Gambia at the moment is the lack of stable power supply, and this is especially obvious in the hospital. Luckily for the operating theatre and ward there are back up fuel generators for when a power cut occurs, but the rest of the clinics have to wait in humid darkness until the electricity returns. If anything, seeing how regularly the power abruptly cuts out has really emphasised the importance of one facet of Paul’s maintenance talk yesterday. He strongly advocated wider usage of UPS (universal power supply) systems, surge protectors and voltage stabilisers, to protect the machinery from any wild fluctuations in energy which can damage the delicate circuitry. This is of course one reason why technology fails so much quicker than normal here, and unfortunately does lead to some patient harm when they are unable to have certain tests because the machine is broken again. Hopefully the changing fortunes of the whole country will soon lead to better conditions in the hospital too (also if they just fitted solar panels to the roofs they would be sorted for life!). Day two began with a great talk from Paul about equipment maintenance, reminding us that every staff member holds responsibility for the medical equipment. 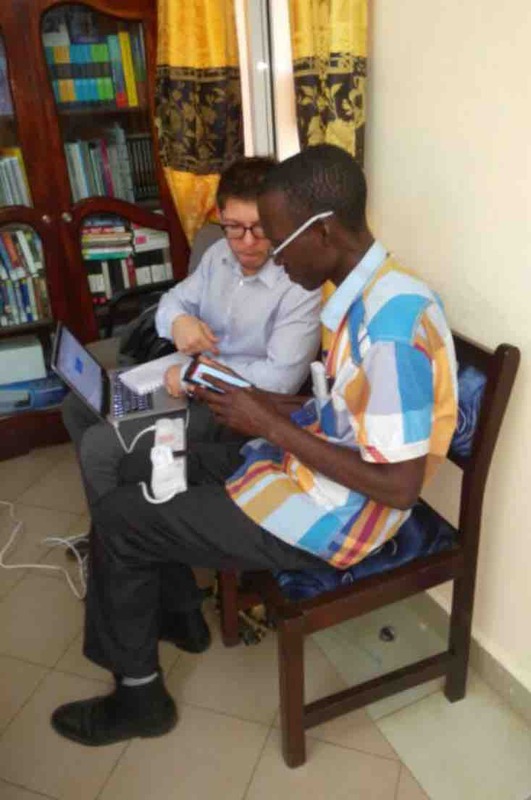 John followed this with an introduction to diabetic retinopathy, an incredibly pressing need to address soon in the Gambia, as the disease may well become more prevalent as the country continues to develop. The new testing room in SZRECC, where children are first assessed. It’s based in the old laboratory used for manufacturing eye drops. On Tuesdays, SZRECC holds a glaucoma clinic, which unfortunately for me doesn’t typically involve many paediatric patients. Nevertheless I hoped to use the day as a chance to teach paediatric assessment skills to some of the eye nurses and optometry students, as well as observe some of John’s oculoplastic surgical cases. The surgical list was regrettably postponed at short notice due to a poorly anaesthetist, but the training with the students went well. We had the afternoon free to run through testing young children’s vision, checking for squints, and checking the eye muscles. I was luckily able to demonstrate assessment of squints on a real patient, as a relation of a staff member was willing to sit patiently and be used as a practice subject. The highlight of my day was when a student from last year, Dou, perfectly remembered his teaching from last year despite not having had any further practice or lectures on the subject. It was the first time on this visit, that I really noticed having made a difference with my previous teaching, which was a really gratifying experience. A busy day awaits tomorrow, another paediatric clinic, and a chance for the students to put some of their new-found skills to the test. Despite long fog-related delays in the travel last friday, the team of 4 has arrived in one piece: paediatric consultant Dave Laws, oculoplastics consultant John Roberts-Harry, medical electronics engineer Paul Lawrance, and myself, Rhys Dumont Jones, orthoptist. We had a good weekend which was entirely, definitely, 100% filled with productive work sessions, and only a tiny smidgeon of relaxation time. We did have a good early morning bird watching trip, and a very valuable meeting with the senior management team of the hospital, in which we reevaluated its progress, and what our plans were for the upcoming week. We arrived today in Sheikh Zayed Regional Eye Care Centre (SZRECC) and were immediately bowled over by the generous welcome of the staff and students. 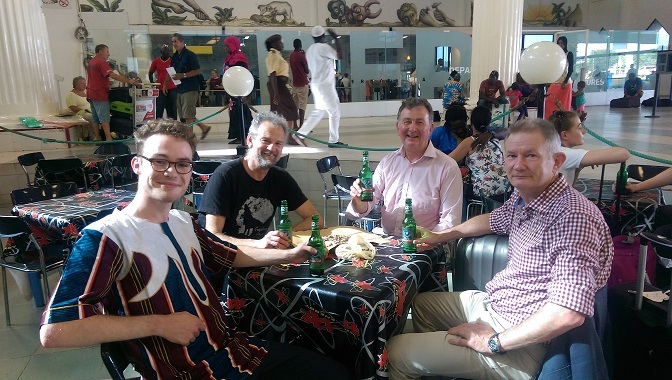 It was great to catch up with old acquaintances, and be introduced to some new faces too. We convened in the lecture theatre at 08:30 sharp, where a full hall of ophthalmic practitioners, doctors and ROTP (regional ophthalmic training programme) students awaited. Today’s morning teaching session was held by Dave and John, who respectively covered the topics of world blindness, and glaucoma. We were then taken to the clinics where many patients already waited. The booking clerks had arranged for children in particular to be brought during our visit, and today’s clinic promised many interesting and unusual challenges. For those unfamiliar with the clinic system: the waiting room is unlocked at around 9-9:30, and the room filled with patients until fit to burst, and no more can physically be admitted. There is no agreed finish time, staff only leave once all patients have been seen. I can only speak for myself of course: I had a long and tiring day, over 30 children came through the door of the testing room. It seemed as if the pile of notes was constantly growing and never even being dented for all our efforts. 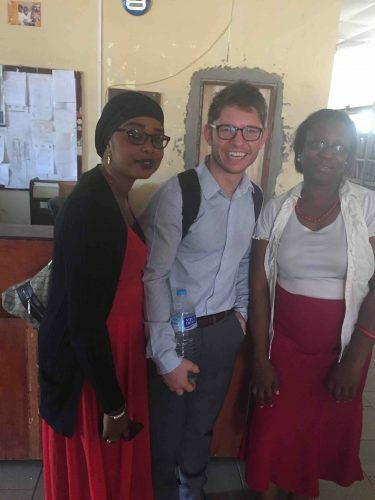 There was a huge range of ocular pathology, over half of the children having visual impairment in at least one eye, due to reasons such as cataracts (infantile and traumatic), ocular albinism, infection and corneal scarring. The ophthalmologists are planning to admit as many of these children as possible to remove cataracts, and restore some useful sight, potentially a life-changing improvement. I found it difficult to teach effectively with such a volume of patients requiring assessment, but the staff I was working with were energetic and very keen to learn. We have (slightly) quieter sessions planned later in the week to go over techniques in visual assessment in more detail. I will be writing a daily blog to keep the internet posted about my experiences here, so tune in tomorrow for another installment!